← New to Yoga at Hemma? 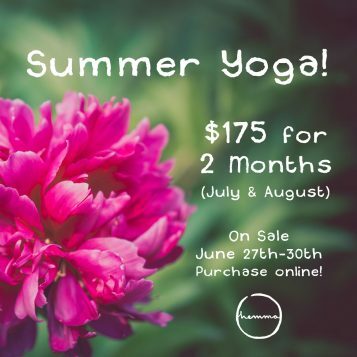 Say YES to Yoga this Summer! Victorians have been very patient for Summer this year and at last, the sun has arrived! The forest, the beach, the ocean, festivals and picnics start to call you to play. But what about your Yoga mat? Do you let it get dusty in the corner of your home? People often ask me if the studio gets quiet in the Summer and they seem surprised when I tell them it’s a actually a busy time of year for us. According to Chinese Medicine and Ayurveda, Summer is when the fire element is most prominent and the tendency to go-go-go seems to increase. This means that now, maybe more than anytime other time of year, you need practices keep you cool, calm, balanced, and grounded. You need practices to strengthen your body if you are adopting a more active lifestyle; practices to strengthen your mind if you have a tendency to over-work; practices to strengthen your capacity to accept things as they are. As Summer starts to heat up, keep your feet on your Yoga mat. To help you get to your mat this Summer, we are offering a 2 month pass, valid for unlimited classes in July & August. It’s on sale now until June 30th in person or online. Stay cool and see you on your mat!